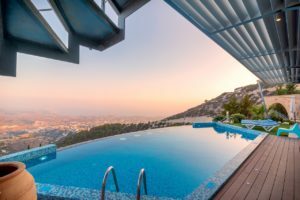 This may seem like common sense to many people but you’d be surprised at the number of times we get asked the question: so just how does a saltwater pool chlorinator work? A salt water cell is basically a chlorine generator and understanding the process can actually help you make your chlorinator run more efficiently, improve the quality of your swimming pool’s water and reduce the need for additional chemicals. In swimming pools, salt is typically added to the pool by pouring it across the bottom and sweeping it with the pool brush until it dissolves. The saltwater chlorinator consists of a control box and a salt cell. The chlorinator cell consists of parallel titanium plates coated with ruthenium and iridium (precious metals from the platinum group of metals). The control box sends a safe electrical DC charge to the cell. As pool water passes through the salt cell, the salt in the water is turned into Hypochlorous acid. This is the same component that is produced when any chlorine is added to pool water; whether you use sticks, tablets, granular or liquid. As the water returns to the pool, it will introduce the newly produced chlorine, keeping your pool sanitised and healthy! We love salt water chlorinators but then you’d expect us to say that but quite honestly it is the most eco-friendly, cost-effective method of keeping your pool water crystal clear and hygienic all year round. Using salt in your pool water and keeping your water chemistry balanced also lessens skin and eye irritation, reduces the usage of chemicals and waste and is better for the environment. And to top it all off, the overall savings make these low maintenance and eco-friendly products well worth the investment. At Allchlor, we can repair your existing chlorinator if it’s no longer running efficiently or we have a range of cost-effective salt water chlorinator systems. Check out our range for more details or contact us on 07 3277 2554 for repair advice.